“Black Panther,” Marvel’s newest superhero installment, provides a captivating story along with compelling characters and themes. 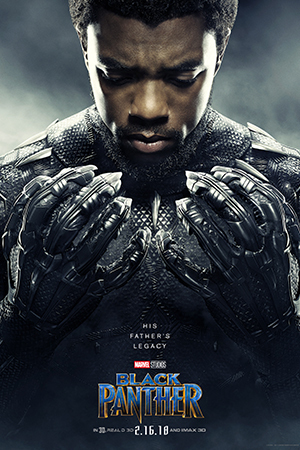 The film follows the Marvel comic superhero Black Panther, aka King T’Challa, as he returns to his home country and kingdom of Wakanda to combat the sins of his ancestors and quell a rebellion from the inside. Black Panther provided many entertaining aspects, serving to both engulf the audience and flesh out the fictional African country of Wakanda, the main setting of the movie. In terms of set and costume design, this movie has most other Marvel films beat. The use of color in this film makes everything within Wakanda feel alive and vibrant. The visuals were overall positive, albeit with some subpar use of cgi. The soundtrack was also put to very good use in the movie. While a bit repetitive, much of the music from the movie when listened to on its own can give a vivid idea of the scenes, settings or characters they represent, attesting to the strength of the soundtrack. The highlight of the movie was the portrayal of the the villain Erik Killmonger by actor Michael B. Jordan. Jordan has been known to have his best performances when working with director Ryan Coogler, and Killmonger is no exception. His character is a divergence from the general formula of Marvel Cinematic Universe villains by being more complex and sympathetic than your average big bad, putting him on par with their other great villains such as Loki and Vulture. Providing an electrifying performance, the only caveat to Jordan’s contribution to the film was his lack of screen time. He definitely could’ve been used more and his interactions with the Black Panther, his adversary, should have been more numerous and fleshed out. Characterization was also a bit lacking in many key figures, most harsh for the eponymous hero Black Panther himself, due to his obvious importance to the story. While Chadwick Boseman’s acting was superb, I do feel the character was made a bit bland in this movie, particularly because of his lack of a true internal conflict. Because he’s dealing with the faults of his ancestors and not his own, there is no personal growth for T’challa. He made little to no mistakes in the movie and had little to no flaws making him a tad boring. Nevertheless, the character was portrayed well with perfectly timed humor and emotional depth. Overall, “Black Panther” is a very good film. With satisfactory comedy, good action and an simple yet effective storyline, “Black Panther” is sure to captivate many audiences. As promotion for Marvel’s new movie, “Black Panther”, “Black Panther: The Album” was released to accompany the movie and the music delivers in a multitude of ways. Curated by Kendrick Lamar and involving many other household names from Top Dawg Entertainment, the songs off this album are experimental and align with the themes of the movie. The three singles off the album are all standout hits forming a strong backbone for the overall piece. 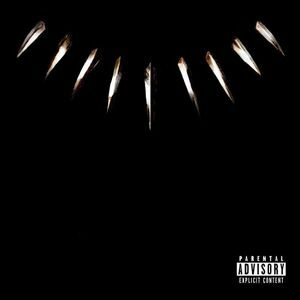 After introducing the album with the appropriately titled “Black Panther,” by Kendrick Lamar, the album really kicks off with the first single, “All the Stars” by Lamar and SZA, a great song with astounding vocals by SZA and bars from Kung-fu kenny himself. The content of the song also provides a tone that is followed for the rest of the album; this is an album about blending genres and musicians you might not have previously given a thought or never heard of. The other singles “King’s Dead” and “Pray for Me” are also songs filled with energy and unique sounds, “King’s Dead” being a strong standard rap song, composed of generally strong bars with some questionable lyrics. “Pray for Me” performed by Kendrick Lamar and The Weeknd, matches “All the Stars” in tone while definitely being its own song with it’s own strengths. However, “King’s Dead” also includes an interesting aspect from the album: the connection between the music and the storyline of the movie “Black Panther”. The context of the movie is embedded in the music, some songs being told directly from the perspective of either the hero, Black Panther or the villain, Erik Killmonger. Songs such as “Paramedic” by SOBxRBE along with the aforementioned “King’s Dead” are not only intensely strong songs but also set up a story that matches almost perfectly with the perspective and themes of Killmonger’s character. This is but one aspect that gives “Black Panther: The Album” a really special feeling in comparison to other albums. Other great songs that hold up the album’s strength are “X,” “Opps,” “Bloody Waters,” and “Redemption.” “Redemption” by Babes Wodumo and Zacari shows off another great way this album sets itself apart, the blending of two cultures, in this case African-American and African. This aspect of the album is due to Lamar’s ideals and vision matching up with an actual topic within the “Black Panther” movie: the interaction between African and African american cultures. Adding African artists like Babes Wodumo and teaming them up with African american artists like Zacari allows this album to contribute something special to the music world. “Black Panther” the album on its own functions as an independent and wonderful piece of music. The music has much offer with originality and incredible beats to spare. In addition, listening to this album along with having watched Black Panther or in anticipation of the movie gives the songs very special meaning. I suggest you do both but you don’t have to because with or without the movie, “Black Panther: The Album” is great.